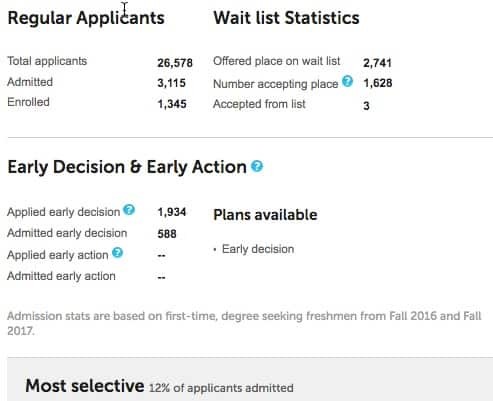 High school seniors, who are aiming for prestigious colleges and universities, will soon have to decide if they will apply early decision. I’m using Johns Hopkins University to illustrate what you’ll discover. Click on the school’s Applying link in the left-hand column. The most recent acceptance rate for all applications at Johns Hopkins was 12%. In contrast, the ED acceptance rate was 30%. At some schools, an even greater divergence in the rates exists. 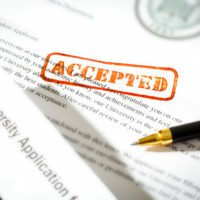 The College Board provides a school’s overall acceptance rate, but you’ll have to do the math to generate the the ED and Early Action acceptance rates. 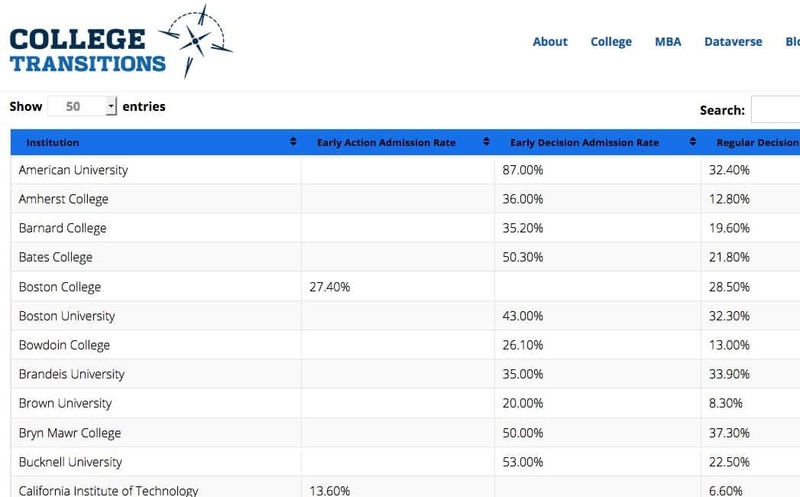 Rather than researching schools individually, you can head to College Transitions, a college consulting firm in Georgia, which compiles these admission figures for you. You’ll also find many other key college statistics in the firm’s Dataverse resource section. 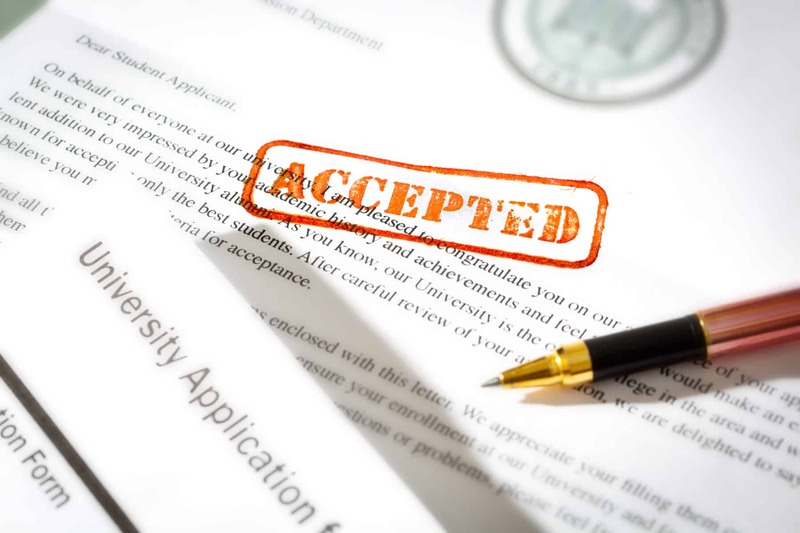 Have you ever encountered a school that has an early decision program where a student could opt out of an acceptance if the financial award was not enough? I am wondering about Harvey Mudd College in particular – my son’s number one choice – but our finances are limited. Might they put something in writing to let him apply early decision with an opportunity to review the financial award granted before accepting their offer. I would not apply Early Decision to Harvey Mudd (an excellent engineering/liberal arts college), or any other school, if the institution’s net price calculator suggests that the cost will be prohibitive. In the past, it was a crap shoot to apply ED because of the unresolved money issue, but now many elite schools offer very good net price calculators that provide a family with a solid estimate of what an institution will cost them. A net price calculator will provide a personal estimate of what a school will cost after any grants and scholarships from the institution itself are deducted from the price tag along with any applicable state and federal grants. To arrive at a net price, a good calculator will require parents to provide parent and student income and assets. If a school offers merit scholarships, in addition to need-based aid, it will also require a student’s GPA and test scores. Unfortunately, about half of the nation’s colleges and universities use lousy calculators that are just about useless. These pathetic calculators use a federal template that ask the users few questions. It’s a good bet that the calculator is a poor one if it takes about a minute or less to use. I don’t think it’s much of a risk to apply ED to elite schools that offer excellent financial aid packages. If a college has pledged to meet 100% of the demonstrated financial need of all its students, I believe it will usually be safe to apply. And sure enough, when the mom used Harvey Mudd’s solid calculator, it estimated that the price would be just $15,000 for her son’s freshman year. The cost of attendance of this school, which is located in Claremont, CA, is $77,000! Attending Harvey Mudd at this price would be a tremendous bargain.